I’m now in the barracks and have just a short time to write before the lights go off. I wanted to ask you to send my clarinet. They are forming a band in the company and I want to join it. The commander is very strong for anything musical. He said if we send for our instruments, the army would take care of them for us. They will ship them any place we go…. The letters came from Fort Devens, Massachusetts, from Camp Pontchartrain, Louisiana, from Dutch East Indies, New Guinea, and the Philippines – approximately 150 in all. Jack Rogers enlisted in the Army in 1943, at age 19. He was assigned to the amphibious engineers unit and spent three years on active duty, two of them in the South Pacific. When he returned from the military, he embarked on a lifelong career as an artist, illustrator and teacher. I met him many years ago when he taught art at my sons’ elementary school. A founding member of the Spokane Watercolor Society, Jack started the art department at Spokane Falls Community College in 1963 and taught there for 26 years. He never actually retired. In fact, he was still painting and teaching the last week of his life. Recently, I went to Fran’s 95th birthday party. As I was leaving, their daughter Nancy asked if I’d like to read some of the letters Jack wrote home while serving during World War ll. I eagerly pored over them when Nancy dropped them off. I thought I knew Jack and World War ll history pretty well, but these letters offered a new glimpse of military life during the war and they also reveal Jack’s wit and talent for telling a tale. Many of the envelopes are illustrated with his whimsical sketches and drawings. Boy Mom, you ought to see me sew my insignias on. I can almost thread the needle every time. And as for my laundry, well they give you plenty of G.I. soap. We have plenty of water the rest is just plain elbow grease…. Even the more serious anecdotes feature Jack’s flair. Last Thursday Red was on guard. He felt a little sick, so he sat down and went to sleep and the O.D. caught him. Well, if you don’t know it that is a very serious offense in the Army. Friday they had a court marshell (sic) but no one would testify that he was actually asleep, so they charged him with sitting down while on duty. He often couldn’t tell them exactly where he was or what his training entailed. “You know, military secrets,” he wrote. But in one letter he enclosed a small card emblazoned “Ancient Order of the Deep” that certified he’d crossed the equator aboard the S.S. Extavia on May 10, 1944. Last night we slept on deck as it was too stuffy below. Although the steel deck didn’t have much spring, it was a lot cooler. He asked his mom to send him things like white handkerchiefs, jockey shorts and coat hangers. She dutifully noted his requests on the backs of the envelopes. In a 1944 letter from New Guinea, Jack already sounds like an old soldier instead of a young recruit. Company had a rifle and personal inspection. It was the first we have had since leaving the States. How I remember the days when you shined your boots ’til you could shave in them, stood in ranks thinking of all the things that could hold up that weekend pass. Did you remember to tuck your handkerchief all the way in the pocket? Could you have missed a button, or could some dust have gotten on your rifle? But a letter from Dutch East Indies shows that he and his buddies were still kids at heart. They got a bulldozer and fixed up a softball field. And we have a league started in the company, playing in the evenings and Sundays. It sure roused a lot of company spirit. It reminded me of what he’d said in an interview. “Our whole company was made up of kids – kids dressed up as soldiers,” he’d said. On Dec. 23, 1944, Jack wrote of Christmas plans. Cornie is now fixing up a little java for us and we broke down and opened one of our fruit cakes. We were talking tonight that we would get us a small palm and decorate it, but I’ll be darned if I know what we’d use for decorations. Jack’s unit was the first one back into Manila, Philippines, after Gen. Douglas MacArthur’s famous landing, and they served as part of the occupational forces in Japan. They were torpedoed by subs and shot at by kamikazes. The letters from home served as their lifeline – their connection to the world they’d left behind and the world they wanted to come back to. Good nite Mom and don’t worry about anything on this end. Write soon. Your loving son, Jack. The notes from friends. From family. From readers. 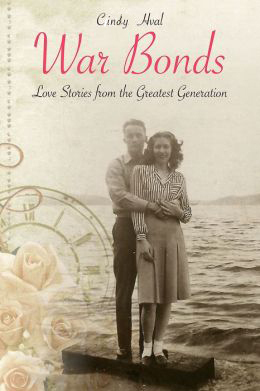 And I learn another beloved person featured in War Bonds: Love Stories From the Greatest Generation has died. Recently, two lovely War Bonds brides passed away within a month of each other. Christine Jasley died on September 16th. She was anxious to be reunited with her husband, John, who died in October of last year. Then last week I learned of the death of Helen Loer. On Saturday I will be at her Memorial Service and will read Chapter 7 “From Sailor to Preacher.” Her husband James, that sailor/preacher will be sitting in the front row, and my heart aches for him. The Loers had been married 68 years. Our world is diminished with each loss, but I’m so very thankful that their stories remain. The fading late afternoon sun, blurred by the haze of wildfires, fell softly across the foot of his bed. A smoke-tinged breeze wafted through the open French doors. His once-commanding frame seemed frail against the stark whiteness of crisp sheets and rumpled pillows. I stood quietly beside him, a writer at a loss for words. The World War II veteran and Pearl Harbor survivor had endured many things, but the loss of his beloved wife, Tex, was proving too much for his heart to bear. After more than 70 years with her, he doesn’t want to be here without her. I met Nick and Tex in 2010 when I shared their Love Story with newspaper readers. His regal military bearing and her gorgeous red hair and sense of style made them one of the most elegant couples I’ve interviewed. Six weeks later he collected that $10 as he walked down the aisle to marry Tex. His smile faded when he recalled the horror of the attack on Pearl Harbor. The young private was in charge of air/ground communications at Hickam Air Field on Dec. 7, 1941. He was asleep in his bunk when the earsplitting scream of airplane engines and the rat-a-tat sound of bullets strafing the barracks woke him. Grabbing his pants, he scrambled out the door. As he ran down the beach back toward his duty station, a Japanese Zero strafed the sand around him. He hit the ground and covered his head. Gaynos said he felt a hot breeze and heard a whistling sound inches from his ears. He looked up and saw the face of the pilot as he flew alongside him. The pilot grinned. After Pearl Harbor he was sent to Officer Candidate School and quickly moved up through the ranks. He married Tex in 1943 and enjoyed a long military career followed by a successful second career in real estate. On a recent day, I came to tell him that their story will be included in a book I’m working on and to collect photos for the project. His daughter warned me that his health was fading and he wasn’t expected to live much longer. His caregiver greeted me at the door and Gaynos opened his eyes briefly when I entered the room, then he sighed and turned away. I sorted through the photos, selecting the ones I needed, and when his caregiver went to photocopy them, I approached his bed. His eyes fluttered and he slowly raised his hand. I took it and he wrapped his fingers around mine. His eyes fell shut, but his grip on my hand was firm. I told how I admired Tex, and how much I appreciated that after talking about the awfulness of war, we were able to laugh together at the silly jokes and stories they shared. He sighed and released my fingers. I heard his caregiver returning to the room, so I bent down and kissed his brow – taking a liberty I’m sure Tex wouldn’t mind. According to recent statistics, World War II veterans are dying at a rate of 555 a day. Time is running out to tell their stories. But in this case, not only did I get to share this hero’s story, I also got to say goodbye. As I drove away, my eyes blurred and the tears that had threatened all afternoon fell. The tears weren’t of grief, but of gratitude. This column originally appeared July 31, 2014 in the Spokesman-Review.